ROCKINGHAM — It was supposed to be easier than that. 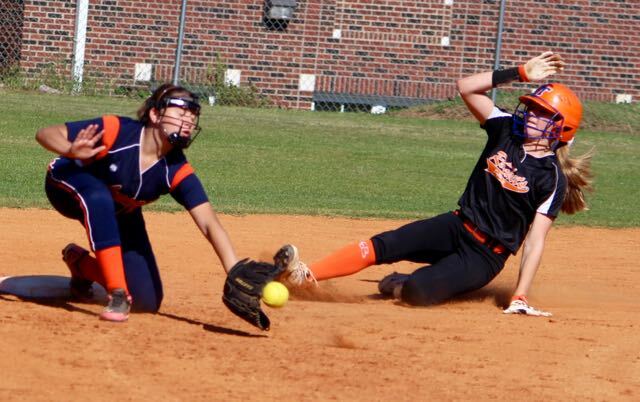 Earlier this season, the Rockingham softball team beat up on Anson 9-5, and the final score suggests the contest was closer than fans know it to have been. So when the top-seeded Rockets hosted the No. 2 Bearcats on Wednesday afternoon for the Southeastern Middle School Athletic Conference championship, it figured to be another ho-hum game. 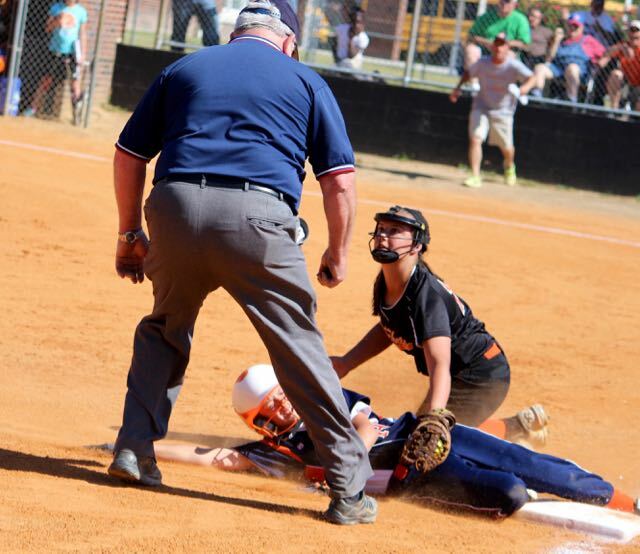 Rockets third baseman Kyla Hawkins looks to the umpire to confirm she applied the tag to Anson baserunner Reagan Jackson in time. She did, and the play ended the top of the second inning. It was anything but as the Rockets held on for an 8-7 thriller. Hailey Miller’s two-out triple in the top of the fourth inning scored Madison Jordan for a 7-2 Rockingham advantage, and Miller raced home on an errant throw. Momentum shifted to visiting Anson. The Rockets led 8-4 heading into the top of the sixth. Kaitlin Brower led off the frame with a single up the middle — a soft spot in Rockingham’s defense much of the afternoon. Rockets hurler Taylor Parrish struck out Savannah Houser swinging. Brower advanced to second on a wild pitch, then Grace Morgan laced a grounder past third baseman Kyla Hawkins. That put Brower on third and Morgan on first with Jordan Sykes at the plate. Sykes, Anson’s pitcher, knocked a run-scoring single to left field to pull the Bearcats within 8-5. A groundball out moved runners to second and third, which was perfect positioning for Ashlyn Watts’ two-run double. Rockingham’s six run lead had been reduced to only one. Parrish struck out Destiny Barrett to end the inning. Kyla Hawkins drives the ball to deep center field to lead off the bottom of the third inning. 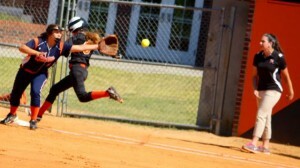 She scored on Taylor Parrish’s double for a 3-2 Rockingham lead. The Rockets went down 1-2-3 in their half of the sixth. In the top of the seventh and final inning, Parrish forced Reagan Jackson into a grounder to second. The second baseman knocked it down and stayed with it long enough to push the ball over to first for the first out of the inning. Brooke Baucom grounded out to third for the second out. Brower slapped a single up the middle to keep the inning alive, but Houser hit a weak grounder to Kaylie McDonald at first, who tapped the bag with her right foot for the final out. Anson (11-2) took a 2-0 lead in the top of the first. Brower singled to center and Parrish walked Morgan. A passed ball put runners on second and third for Watts, whose single to center scored both baserunners. The Rockets scored twice in the bottom of the first. Sykes walked Rockingham’s first two batters in Savannah Lampley and Kyla Hawkins and both runners moved up a base on a passed ball. Bunt specialist Jadyn Johnson laid down a sacrifice to score Lampley and Hawkins scored on a wild pitch. Savannah Lampley slides safely into second base in the bottom of the fourth inning. She and Kyla Hawkins scored on Taylor Parrish’s two-run double for a 5-2 lead. Hawkins led off the bottom of the third with a double to deep center field and from the batter’s box Parrish helped her cause with an RBI double to left for a 3-2 Rockets lead the team wouldn’t relinquish. Rockingham loaded the bases — McDonald at first, Miller at second and Jordan on third — with two outs, Carlee Wilson struck out looking to end the scoring threat. The Rockets picked up their offensive spurt when they came to the plate in the fourth. Lampley drew a walk and stole second and advanced to third on Hawkins’ soft single to second base. Hawkins went to second on a passed ball and Parrish pushed both runners home with a double that gave Rockingham a 5-2 lead. Johnson sent a screamer up the middle to extend the inning and the speedster promptly stole second and third before scoring the Rockets’ sixth run on a passed ball. 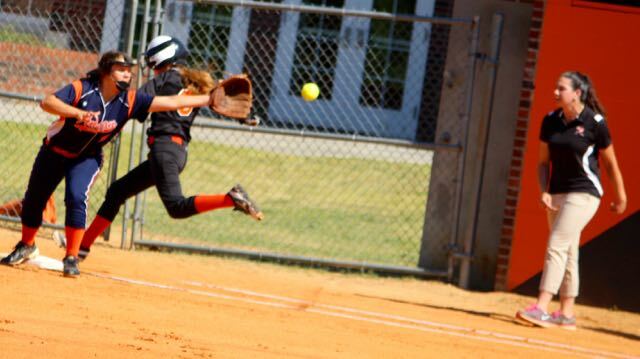 The umpire called Hailey Miller out on this close play at first base to end the first inning. The inning continued as Jordan drew a walk — the seventh issued by Sykes in the game to that point. Jordan stole second and third and scored on Miller’s RBI triple. Miller also scored on the the play on a defensive miscue. On the mound, Parrish struck out seven and walked four in seven innings. 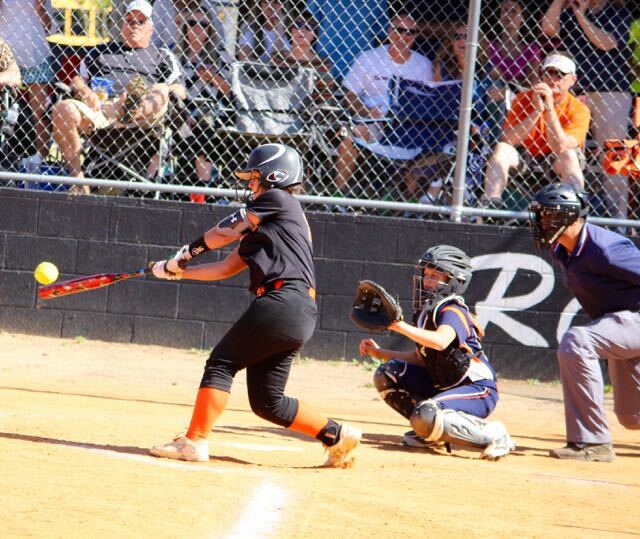 At the plate, she went 2-for-2 with three runs batted in. With two runners already on base, Parrish was intentionally walked in the bottom of the fifth as Anson faced an 8-4 deficit. The moved paid off, but barely, as Johnson smacked a liner that was speared by Brower at short. For Anson, Sykes pitched six innings, struck out five and walked eight. Taylor Parrish was all business in her warm-up tosses before the start of the Southeastern Middle School Athletic Conference championship contest against Anson. ROCKINGHAM — The Rockingham Middle School boys soccer team advanced in the conference tournament with a 4-1 win over visiting West Hoke.